The Peggy Notebaert Nature Museum, located smack dab in the middle of the expanse of green we lovingly call Lincoln Park, has a wonderful array of fall themed programs for families. Year round, my two-year-old loves the Judy Istock Butterfly Haven, where colorful butterflies flutter around, often times landing on your head or your outstretched arm if you’re patient (and lucky!). She also loves when museum volunteers take out a beloved woodland animal – the turtle is her current favorite! – for petting time. My ten-year-old son likes the Istock Family Look-in Animal Lab, another permanent exhibit, where you can watch as scientists and volunteers study a variety of animals (visit naturemuseum.org for dates and times of water snake and praying mantis feedings!) Both of my kids love playing with the year-round Riverworks exhibit, which invites kids to play with the waterways that make up our Chicago ecosystem. Check out the Musuem’s website at www.naturemuseum.org to register for one of the many other special Autumn themed happenings, from guided nature walks to worm composting clinics, from Polish and Spanish language classes to craft make-and-takes, the Nature Museum has something for every family that loves nature. Looking for a some spooky and slithery fun? How about having supper with some ssssssnakes? 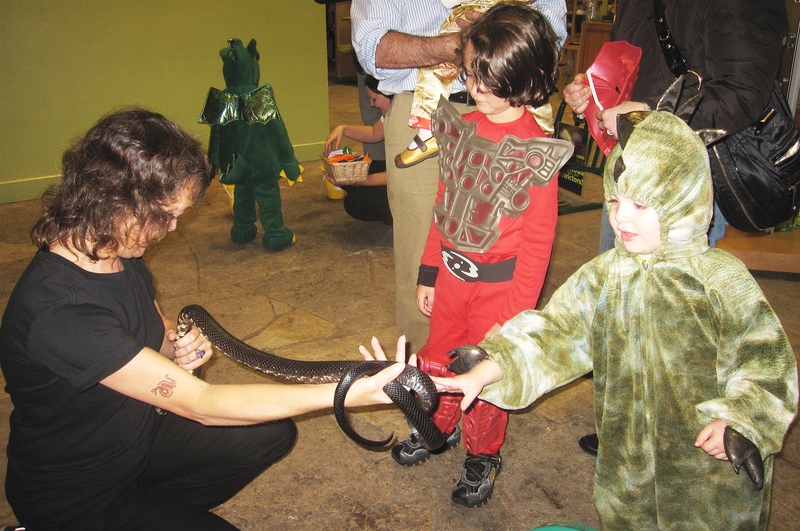 The Museum will once again host the annual Supper with the Snakes event October 29. You’ll enjoy a pizza dinner while meeting eight species of snakes. There will be fun games to play, including rattlesnake mastery, create-a-creature and snake investigation stations. Guests will also receive some fabulous and spooky prizes. Don’t forget to wear your costume! WHEN: Saturday, October 29, 5:00–7:00 p.m.
REGISTER: Space is limited. Register at www.naturemuseum.org. This entry was posted in Family and tagged Peggy Notebaert Nature Museum. Bookmark the permalink. Aww, that’s so cute. Brave kid, while others are afraid of touching it he managed to touch it without being scared at all.